Six years after the original Toyota Fortuner was launched in India and became and overnight success, Toyota has launched the all-new Fortuner with more features, more engines, sharper exteriors and a new interior. 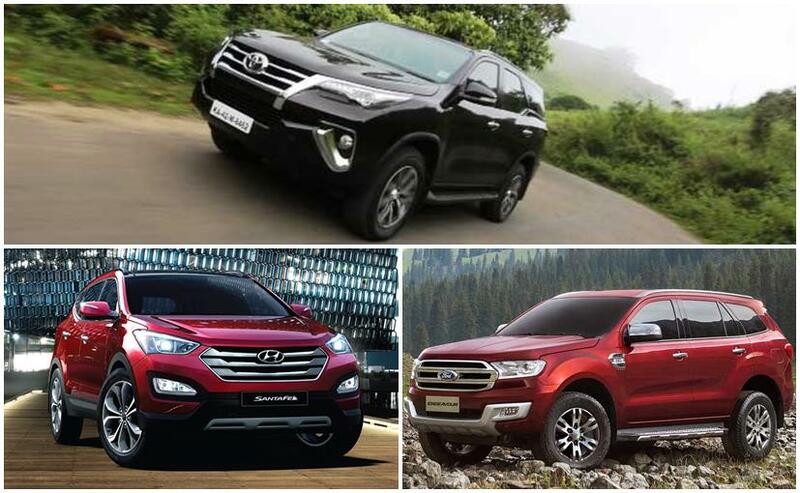 Let's see how it faces up against its biggest competitors, the Ford Endeavour and the Hyundai Santa Fe in an all-out spec comparison battle! The original Toyota Fortuner came with just one engine option. The new Fortuner gets a diesel and a petrol engine. Lets start by comparing all three cars and their diesel engines first. The newest Fortuner gets a 2.8-litre motor with 175bhp of peak power. The Fortuner also gets both an automatic and a manual gearbox option right from launch. The torque figure on the manual is 420Nm whereas the automatic is more powerful at 450Nm of peak output. Both the manual and the automatic get both rear-wheel-drive and four-wheel-drive options. This means that there is something for every type of driver in the new Fortuner range. The Ford Endeavour on the other hand gets two diesel engine options. The largest and more popular 3.2-litre 5-cylinder diesel makes 197bhp of peak power and 470Nm of peak torque. The 3.2-litre engine only gets an automatic gearbox and you can have it with a four-wheel-drive with driveline. The smaller engine is a 2.2-litre 4-cylinder engine that makes 155bhp of peak power and 385Nm of torque. This engine will go up against the 2.4-litre Toyota Fortuner which we've already driven. The 2.2-litre Ford Endeavour gets both a 6-speed automatic and a 6-speed manual and you can have both gearboxes with either a rear-wheel-drive or a four-wheel-drive option. The smallest SUV of the lot here is the Hyundai Santa Fe. That said, the Santa Fe's 2.2-litre engine (which is the only motor you can have in it), makes a very healthy 194Bhp. The Santa Fe is available with both a manual and an automatic with 421Nm and 437Nm of peak torque respectively. There is an all-wheel-drive option on the Santa Fe but it is only available with the automatic whereas you can have a front-wheel-drive setup with both manual and automatic gearboxes. Where the Fortuner and the Endeavour are both ladder frame chassis, the Santa Fe is a monocoque construction. The Endeavour with the 3.2-litre engine is the most powerful here in terms of both horsepower and torque followed closely by the other two. Where the Santa Fe is more powerful, the Fortuner does make more torque (in the automatic versions). Where the Fortuner and the Endeavour feel more like old-school SUVs, the Santa Fe's engine combined with the lighter weight means that it is quicker and more responsive on the whole. The Fortuner also gets a 2.7-litre petrol engine that makes 164bhp of peak power and 245Nm of peak torque. The petrol powered Fortuner can be had with a 5-speed manual gearbox or a 6-speed automatic gearbox but is only available in a rear-wheel-drive layout. The petrol powered Fortuner is the only one in the full-sized SUV segment that gets a petrol motor. The other cars in this price bracket that get a petrol motor include the Honda CR-V. Other much smaller, compact luxury SUVs like the Mercedes-Benz GLA also gets a petrol motor option. If you want an SUV that has unparalleled street presence, the fight is clearly between the Ford Endeavour and the Toyota Fortuner. You can check out our gallery of the Fortuner to see how it's grown. But, the Hyundai Santa Fe isn't far behind so lets see what the figures are. The Ford Endeavour is the longest SUV here and has the longest wheelbase between the three at 4892mm and 2850mm respectively. The Fortuner follows a close second at 4795mm long and a 2745mm wheelbase. Although the Santa Fe is much shorter at 4690mm, the wheelbase isn't too far behind the likes of the Fortuner measuring in at 2700mm. Strangely, even though you would expect the Endeavour (1860mm) or the Fortuner(1855mm) to be the widest here, they aren't. That goes to the Santa Fe, which at 1880mm is the widest SUV here. The Ford Endeavour and the Toyota Fortuner of course are much taller at 1860mm and 1855mm as compared to the Santa Fe that comes in at 1690mm. That said, the lower height of the Santa Fe does mean that it has a lower centre of gravity. All three cars come with a set of 18-inch wheels with the Fortuner also getting a smaller 17-inch option. The Endeavour gets the chunkiest tyres (265/80 R18) whereas the Fortuner gets a set of 265/50 R18. The Santa Fe gets a set of 235/60 R18, which is one of the reasons why the car is lower than the Fortuner or the Endeavour. In terms of overall safety, the Hyundai Santa Fe, Toyota Fortuner and the Ford Endeavour all come with passive safety systems like crumple zones and high tensile steel construction. The cars also all come with ABS and EBD as standard features in all models. In terms of the number of airbags each car gets, the Santa Fe lacks behind marginally at six airbags while the Fortuner and the Endeavour both get seven airbags. This includes drivers and passenger airbags; curtain airbags, side air bags and drivers knee airbag. All three cars also get active traction control to keep the power in check. With more local content going into the all-new Toyota Fortuner including the diesel engine, the Japanese auto giant has managed to position the SUV in the middle of the competition in terms of priicng. Prices for the new Fortuner start at ₹ 25.92 lakh, going up to ₹ 31.12 lakh for the range-topping diesel automatic; wheres the new generation Ford Endeavour continues to be a value for money purchase with prices starting at ₹ 23.78 lakh for 4x2 diesel automatic and tops off at ₹ 29.97 lakh for the 4x4 automatic. Meanwhile, the Hyundai Santa Fe being a CBU starts at ₹ 28.56 lakh for the manual and goes up to ₹ 31.98 lakh for the automatic version.